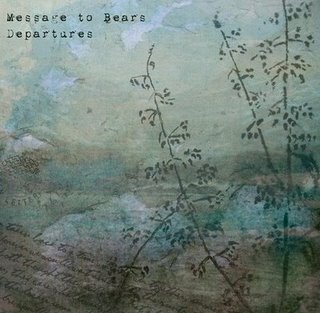 Message to Bears - "Departures"
I don't know if this album really fits as folk, but it's got that same stripped down rustic sound that a lot indie labels are passing off as folk, so what the hell. Got lucky finding this album. Terribly beautiful music. A one man operation, Jerome Alexander, who plays acoustic guitars, pianos, glockenspiels, samples, drums, loop pedal, melodica, toy piano, harmonium, occasional voice. Imagine Nick Drake tunes without the vocals and you get a sense of what's on this album. I picked up Departures, since that's what was available and it sounds great, but I'm even more intrigued by an out-of-print album simply called "EP1", which I'll be buying when it comes back in print again. This album was a great companion on our drive through the countryside this weekend. For a moment I confused it with OK Bear, but that's an amazon freebie from Jeremy Enigk. Jonah, my download of track 2 "Hidden Beneath" drops out after 30-odd seconds in iTunes, and VLC also tanks on this track, but later. I've tried redling it with no change. Does your version work fine? Talk about timing. I was about to post something about this myself, but first I wanted to try grabbing the song with iTunes (and emusic dler disabled), but apparently you've already done that. My first attempt on the song also quit and skipped to track 3, and on my second try, it downloaded the complete song, but only gave me silence after after the first thirty seconds. So, yeah, something is definitely wrong. If we both report it, maybe they'll do something about it. I already reported a problem with the last track on that album (#11? ), which doesn't even allow me to dl it and lists the run time at nine seconds, so they know there are other problems with the album. I'm gonna hop over to emusic now. Does this thing have anything to do with care bears? No, Chicago Bears. And the message is "Fire Ron Turner". They acknowledged the problem and credited me a track, fwiw. Getting the track fixed, well, I guess we'll see. Yes, they did the same for me. Now they've got two tracks on that album to fix; the one mentioned above and the last on the album. The track still hasn't been fixed. However, I noticed that Message to Bears has a Bandcamp page, where you can listen to two albums in full. But they did fire Ron Turner, so shouldn't the name be changed to "Thank-You Note to Bears"? Heh, maybe if they'd have cut him loose a few seasons sooner, perhaps... but the way I feel as a Bears fan, any thank you notes get exchanged, they should be coming in my direction and not the other way around. That team owes me for what they've put me through. And if the Message to Bears guy is out there and reading this, please hop on board the site. Would love to shoot the breeze with you.